Rowman & Littlefield Publishers, 9781442266896, 258pp. The Voting Rights War tells the story of the courageous struggle to achieve voting equality through more than one hundred years of work by the NAACP at the Supreme Court. Readers take the journey for voting rights from slavery to the Plessy v. Ferguson case that legalized segregation in 1896 through today's conﬂicts around voter suppression. The NAACP brought important cases to the Supreme Court that challenged obstacles to voting: grandfather clauses, all-White primaries, literacy tests, gerrymandering, vote dilution, felony disenfranchisement, and photo identiﬁcation laws. 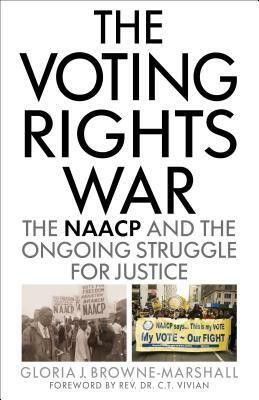 This book highlights the challenges facing American voters, especially African Americans, the brave work of NAACP members, and the often contentious relationship between the NAACP and the Supreme Court. This book shows the human price paid for the right to vote and the intellectual stamina needed for each legal battle. The Voting Rights War follows conﬂicts on the ground and in the courtroom, from post-slavery voting rights and the formation of the NAACP to its ongoing work to gain a basic right guaranteed to every citizen. Whether through litigation, lobbying, or protest, the NAACP continues to play an unprecedented role in the battle for voting equality in America, ﬁghting against prison gerrymandering, racial redistricting, the gutting of the Voting Rights Act, and more. The Voting Rights War highlights the NAACP's powerful contribution and legacy. Gloria J. Browne-Marshall is associate professor of constitutional law at John Jay College (CUNY) and a civil rights attorney. She is the author of Race, Law, and American Society. Browne-Marshall is an award-winning legal correspondent and a playwright. A member of the National Press Club, her weekly columns on the US Supreme Court are syndicated nationwide. She has provided commentary for BBC, CNN, CBS, NPR, C-SPAN, and more. Rev. Dr. C.T. Vivian is a renowned voting rights activist, minister, and community organizer. A recipient of the Presidential Medal of Freedom, he was a friend to Martin Luther King, Jr., a Freedom Rider, and leader of numerous civil rights organizations.